In this post are recipes for homemade marshmallows, Grinch holiday fruit treats, mint-chocolate candies, berry gummies, and raw almond macaroons. Martin’s super-tremendous play group rotates among the houses of the six participating kids. The host usually provides snacks. When we’re at someone else’s house, I let Martin have whatever fresh fruit might be available and also bring a just-in-case treat from his snack drawer. When we are hosting, I try to serve snacks that (1) Martin can eat, and (2) the other children, who do not follow special diets, also will enjoy. That’s not easy. Most kids don’t seem to be into homemade treats (Martin also prefers store-bought, packaged foods), and if something comes in a wrapper, they expect refined sugar, not date-sweetened nut bars or sesame seaweed. Last Friday, for the adults (the parents who hang around, in a separate room, while the kids play), I served fruit and arugula-cabbage chips. I’d bought the chips originally for Martin’s snack drawer. He didn’t like them. I loved them, and last Friday so did the other parents. Perhaps arugula-cabbage chips are a more “refined” taste. In any event, if Martin had wandered by the grown-up table and helped himself to chips, we would have been fine. 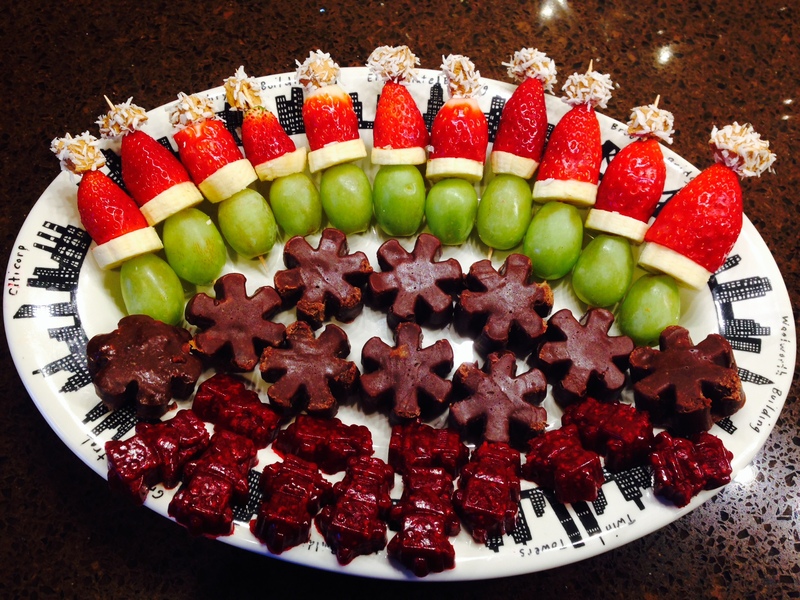 Pictured are Grinch fruits on toothpicks, mint-chocolate snowflakes, and gummy dinosaurs. Coat the inside of a small glass loaf pan with a thin layer coconut oil and powder it with coconut flour. Dissolve the gelatin in the first ¼ cup of cold water and set aside. In a small saucepan, mix the coconut crystals with the second ¼ cup cold water and stir this over medium heat until the crystals dissolve. Then add the gelatin mixture and bring the whole thing to a boil. Transfer to a mixing bowl and allow to cool slightly, then add the salt and vanilla and beat ten minutes or more, until doubled in size. Pour into the loaf pan and refrigerate until you can touch the surface without the marshmallow sticking to your finger. Cut into pieces. At this point, the original recipe instructs to coat the marshmallow pieces in powdered sugar. I wasn’t about to do that. On the other hand, I did have to take some action before I made these bits into pom-poms; because I used coconut crystals as my sweetener instead of refined sugar, my marshmallows came out tan. Pom-poms are supposed to be white! I decided to roll them in unsweetened dehydrated coconut flakes. Not perfect. Close enough. Blend the coconut in a high-speed blender until creamy. (I think many people would do this in a Vitamix. I love my Vitamix, but I don’t like to do too much for Martin with it, because the vessel is plastic. For this recipe I use my 14-year-old KitchenAid glass blender instead.) If necessary, add a teaspoon or two of coconut oil to facilitate the blending. Set aside. Bring the honey to a very low boil and stir for a few minutes. Remove from heat and stir in the coconut cream and the remaining ingredients. Quickly, before the mixture cools, pour into silicone candy molds. Refrigerate until solid. The original recipe calls for pouring the mixture into an 8×8 pan and slicing when cooled. I have done that, too, using a glass pan. The candy molds are more trouble but add cuteness to the yumminess. The gummy creatures were the easiest to make. I got the recipe from the same Generation Rescue presentation as the mint-chocolate candies. To make berry gummies, cook fresh (or even frozen, though I’ve had better success with fresh) berries over low heat until they are fragrant and soft, not boiling. Allow them to cool slightly and transfer to a blender. With the blender running, add pure gelatin in a 4:1 berries:gelatin ratio; for example, if you have one cup of berries, add ¼ cup of gelatin. Immediately pour the mixture into silicone candy molds, wiping away any extra. Refrigerate until they pop easily from the molds. Store in refrigerator. As I am pounding out multiple recipes in a single post, I am going to add one more, for Cara. She’s a mom whose son participates in Martin’s playgroup. Cara complains that I send treats for her three boys and then, when she asks for the recipes, never deliver. Cara has been waiting a while for this one, and in about ten minutes I am going to text her and insist that she read this post, so without further ado, here is the recipe for raw almond macaroons. All measurements are approximate and subject to change based on what’s in my kitchen at the moment of preparation. Mix all ingredients. Form into balls approximately one inch in diameter. If the dough is too crumbly, add more coconut oil or, if it can stand to be sweeter, add more honey. If the dough is too oily, add more almond flour. Roll each ball in more shredded coconut. You’re done! To maintain shape and freshness, these are best stored in the refrigerator. About those marshmallows: After I finished making them, I thought, well, that was a lot of work for just the little Grinch toppers. Maybe I should have bought whatever best-quality organic marshmallows I could find and allowed Martin the tiny infraction of one or two. As it turned out, I needn’t have worried about any infraction. I forgot that Martin—he who once upon a time schemed to get his hands on bananas and ordered strawberries for dessert—recently announced that he no longer likes bananas or strawberries. He refused to touch any Grinch. And the other kids, the ones without dietary restrictions, looked at my tan marshmallows with coconut coating with suspicion and skepticism. The woman who helps me with housekeeping has a daughter with food allergies and a son with social challenges, and as a result she is cautious with their food. During the week she happened to lament, casually, that she couldn’t find any acceptable marshmallows for their hot chocolate. “Did you say, ‘marshmallows’?,” I asked. I yanked my half-pan of leftover Grinch marshmallow from the fridge and cut a bunch of mini-chunks. She sampled one, proclaimed it delicious, and promised to report on whether her kids go for brown marshmallows. We’ll see. This entry was posted in Food, Recipes and tagged ASD, autism, candies, gaps, grinch, gummies, macaroons, marshmallow, recipes, recovery by findingmykid. Bookmark the permalink.